110½ MILES AN HOUR was achieved by the “Comet” on its test run. This streamlined express was built for the New York, New Haven and Hartford Railroad by the Goodyear-Zeppelin Corporation at a cost of £50,000, and the design was submitted to various aeronautical tests. The train was constructed for service between Boston and Providence, Rhode Island, and scheduled to cover the 43.8 miles in 44 minutes. IN Great Britain there is a well-known steam-hauled train called the “Comet”, which runs daily, except Sundays, between London and Manchester. In the up direction this express covers the 133.6 miles from Stafford to Euston in 128 minutes. A newer “Comet” appeared in the USA in 1935. This train, which has Diesel-electric propulsion, is the subject of the present chapter. The American “Comet” is a light Diesel-electric, streamlined train of novel design. It has an engine at either extremity, so that it is not necessary to turn the train at the end of a trip. Both engines are operated simultaneously by a master control, and after the train has completed the run the driver sets his controls, walks to the other end of the train, and begins the return journey. The train broke all railway speed records for New England during a test run in April, 1935, reaching a top speed of 110.5 miles an hour over a one-mile stretch near Kingston, Rhode Island. The train was built by the Goodyear-Zeppelin Corporation for the New York, New Haven and Hartford Railway Company, to carry 160 passengers between Boston and Providence (R.I.), a distance of 43.8 miles, with a stop at Back Bay Station, Boston, in forty-four minutes. It is designed to meet conditions in New England, where distances are short and traffic is dense, and is the first light-weight train put into service in New England. It consists of three cars. On a trial run from New Haven to Boston, with more than 120 guests aboard, the “Comet” covered the 156.8 miles in 143 minutes, averaging 65.7 miles an hour. The total time was forty-seven minutes faster than that of the “Yankee Clipper”, the crack steam express. The 43.8 miles between Providence and Boston were run in thirty-two minutes thirty-five seconds. The “Comet” owes much to airship design. When airship construction in the United States was brought to a standstill by the Macon disaster the Goodyear-Zeppelin Corporation submitted designs and a tender to utilize the experience of its engineers in lightweight alloys and the application of aerodynamics. The tender was accepted by the railway in 1934, and the train was built at a cost of £50,000 with funds advanced by the Railroad Division of the Public Works Administration. Before work began, the streamline was decided by testing models in wind tunnels at Columbia University, and also at the David Guggenheim Airship Institute at Akron (Ohio), the aim being to design both ends so that the whole train would move through the air with the least resistance. It is interesting to refer to the chapter on “The Flying Hamburger”, which begins on page 173, to note that the models for the German train were tested by means of the “wind-canal” used for testing Zeppelin models. The “Comet” differs in some ways from the “Flying Hamburger” and also from the Union Pacific Streamlined Express described in the chapter beginning on page 33, as it is designed for a different kind of traffic. It is different also from the two-coaches French train which can be driven from either end and is described in the chapter “The Rail-Cars of France”, beginning on page 88. Ready to run, the “Comet” weighs about 126 tons, or about forty per cent less than an American steam-hauled train seating the same number of passengers. It was not designed for extreme lightness, but as an intermediate weight train, aluminium alloy being substituted for steel. Each car is built in the style of a tube, the entire framework being covered with heavy-gauge aluminium sheets which form a complete shell, reinforced by the framework, window posts, and bulkheads. There are two Westinghouse Diesel engines, one at either end of the train. These are 400-horse-power six-cylinder units, weighing about 30 lb per hp. Each unit is identical. Each drives a main and an auxiliary generator. The electricity from the main generators is transmitted through various switches and controls to operate the motors, which are geared to the car axles and propel the train. The auxiliary generators supply current to the air-conditioning motors, the lighting system, and the air compressors. Normally both engines are used to enable the train to keep to schedule, but if one engine should fail, the other is able to provide enough power to run the train at a speed of seventy miles an hour. The train is 207 ft long, 9 ft 10-in wide, and 10 ft 11-in high, except for the engine-room, which is 11 ft 3-in high. The undersides of the cars are only 10-in above the rails. This reduction in height, accomplished by lowering the superstructure on the bogies, serves to bring the centre of gravity about 20-in lower, thus increasing the safety of the train at high speeds. The two end cars, containing the engines, are each 74 ft 2-in long, each having accommodation for forty-eight passengers, in addition to the engine-room. The middle car, with sixty-four seats, is 58 ft 8-in long. A HEAD-ON VIEW OF THE “COMET” rounding a curve. The streamlined express has no sharp corners. Its headlight and marker lights are built into the frame. Windows are flush with the surface, and even rivet-head protrusions have been reduced as far as possible. Bogies are placed well back, and the train has a low centre of gravity. In working order the express weighs 126 tons; about 40 per cent less than a steam train with the same seating capacity. The air-conditioning system includes a refrigeration capacity equal to 14 tons of ice in twenty-four hours. Two compressors are driven by motors of 12 horse-power, each motor being in one of the two engine-rooms. Each car has two air-conditioning units fixed over the doors. As there is greater seating capacity in the middle car, the units there have a cooling capacity of 2½ tons each, compared with the 2 tons of the units in the end cars. The larger unit circulates about 1,000 cubic ft of air per minute, and the smaller 800 cubic ft. Ducts on either side of the cars distribute the air, which is delivered from the central units by blowers, the cool air being admitted into the car from either side, at the roof. There is a heating coil in each air-conditioning unit to heat the car in cold weather. There are also facilities to supply steam heat by means of an oil-fired boiler in extremely cold weather. The temperature is thermostatically controlled. 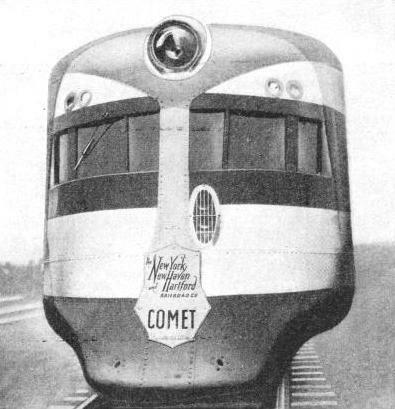 The “Comet” is a three-car articulated train. The rear end of the front car and the front end of the second car rest upon the same bogie, as do the rear end of the second car and the front end of the last car. There are thus only four bogies for the three cars instead of the usual six. Articulation has, therefore, saved weight, aided the streamlining, and led to smoother starting and stopping, because of the absence of the slack in ordinary coupling. All the journals on the train run in roller bearings. The suspension of the cars is novel, hydraulic shock-absorbers being used in place of the usual leaf or elliptical springs. The bogies are orthodox steel castings, but the car bodies ride on coil springs contained within the shock-absorbers, the shock-absorbers being an adaptation of those used on aircraft landing gear. Thus the cars are suspended on a cushion, allowing them to “float” around curves and over the slight bumps at rail joints, with easy riding at high speeds. Not a single light fixture is visible in the cars, the lamps being hidden in troughs which run full-length along either side above the air-conditioning, outlets. The troughs are of aluminium alloy, and the inside is covered with a special highly reflective but softly diffusing aluminium sheet. The light is further diffused and distributed from the ceiling, the effect being that of a shadow-less travelling saloon. As the ceiling is finished in ivory enamel, there is the minimum absorption of light and no glare or shadows. The light distribution has reached a high degree of uniformity, the light at reading level of all seats being the same. Each end of the train has a headlight with a vertical beam of 250 candle power and a horizontal beam of 500 candle-power, streamlined into the contour of the train. There are two powerful sirens at either end. The deep-cushioned scats are set low to eliminate the need for foot-rests, and, similarly to those in use on certain British tramway cars, are reversible. They are set so that a party of four persons can be seated to face in two groups for cards or conversation without cramping. Metal work, including baggage racks, mouldings and curtain carriers, is of aluminium. The floor, of cork, is covered with a brown rubber wearing surface. Doors and steps are automatic, the steps folding up when the doors close, and automatically projecting when the doors open. It is impossible to close the doors if a person is standing on the steps, and the train cannot be started if any door is open. Doors and steps are controlled by compressed air, actuated by electro-magnetic valves. The new type of air brake designed by the Westinghouse Air Brake Company for fast trains has a braking rate three times as fast as that of ordinary brakes. These brakes are equipped with automatic deceleration, set at the rate of four miles an hour a second. By this means a train travelling at a hundred miles an hour would be stopped in twenty-five seconds without jarring. The safety control system adopted requires the driver to keep his hand on the brake valve handle, or his foot on a pedal. If he fails to do so, the power is cut off and the train stops. The “Comet” has a handsome appearance, the streamlining of the exterior being accentuated by alternate wide bands of brilliant blue and shining aluminium, extending the whole length of the train. The roof is finished in grey enamel, closely matching the natural tones of the aluminium alloy of which the train is built. Beneath the roof and above the windows is the first wide ribbon of bright aluminium. The window panels are finished in a beautiful ultramarine blue enamel, tying all the windows together in an unbroken line. Beneath this is another wide band of aluminium. The lowest band is a strip of blue enamel, somewhat darker in tone than the window panels. All the exterior aluminium is finished in a whorled effect, and a clear varnish coating is used to prevent tarnish. 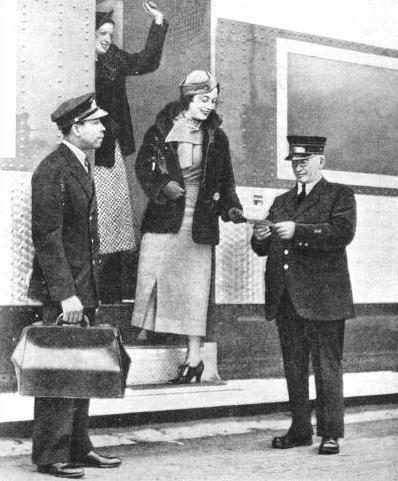 BOARDING THE TRAIN. 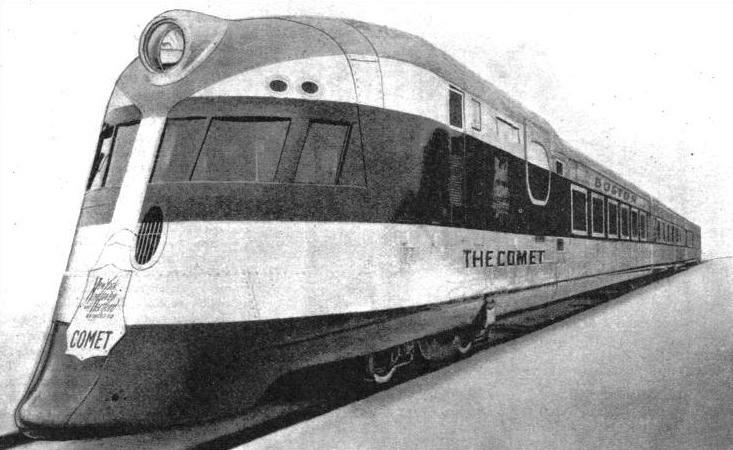 The streamlined “Comet” carries 160 passengers. Steps on the train fold up automatically when the doors shut, and project when doors open. Should a passenger be standing on a step, safety devices come into action; the doors cannot then be closed and the express cannot start. These devices are compressed-air controlled. When the engineers tested the models of the train in the wind tunnels, they had an unusual problem as they were called upon to design a train to travel forwards and backwards with equal facility. As Diesel-electric trains are lighter than steam-hauled trains, and normally run at higher speeds, the influence of the air pressures are very important. On rounding a curve it is essential that a high-speed train should run at least at the speed of an ordinary express, and also have the same margin of safety against overturning. To permit a higher speed through a given curvature, the low centre of gravity was designed. The problem was to design the front and rear ends for a cylindrical middle section, so that the whole would have a minimum of air resistance. The middle section required a smooth, unbroken surface and a shape that, in combination with the two ends, would produce a minimum diagonal and side force for both head and side wind conditions. The train has a low resistance while heading into the air. The front ends are well rounded, and slope backwards towards the roof. The roof arches gradually back into the rear portion. There are no sharp corners; the headlight is streamlined, marker lights, horn and draught gear are covered by the outer surface, and the emergency coupler and its attachments are carried in the car. The middle section of the train has straight side walls, and a well-arched roof and bottom, which join the side walls in rounded curves of large radii. The bottom of the car is smooth, and the bogie-trucks, instead of being separately cowled, are placed as far as possible up inside the body structure. The bogies are thus easy of access for maintenance purposes, and there are no cowlings or shroudings to be exposed to the turbulent air under the cars. Surface-friction has been reduced by making the windows flush with the outside of the cars, covering the gaps between the cars with flat rubber sheeting, and avoiding all unnecessary projections. Unavoidable projections are reduced to a minimum; even the air exhaust ventilators are not exposed to the air stream but discharge the air between the cars, while the fresh air passes through louvers in the vestibule doors. Fresh air is taken in on either side of the rear end of the engine-rooms, passing first through a condenser used for the air-conditioning system, and then through an oiled radiator. Both of these radiators are attached behind openings in the side wall, equipped with a row of deflector vanes. From there the air is passed through a duct towards the roof, and accelerated by an electrically driven blower with thermostatic control. It leaves the car through a water-cooling radiator, which is installed just below the car roof, where the expelled air is again deflected by another row of vanes. The deflector vanes, installed at air intake and outlet, help to correct the air flow, and greatly reduce the air resistance, according to wind-tunnel tests with a model. The vanes are made so that they can be turned round for the motion of the train in cither direction. Cylinders operated by electro-magnetic valves, with air from the brake system, automatically turn the vanes into the proper direction. The weight of the car body structure is only about twenty per cent of the total weight of the completed train. The rating of each engine is 400 bhp at 900 rpm, and is based on an altitude not exceeding 1,000 ft, with the air to the engine not exceeding 80° F. Each Diesel engine works on the four-cycle single-acting solid-injection principle, and the six cylinders are 9-in by 12-in. The efficiency is guaranteed at 0.43 lb at full load per bhp hour, and is in practice 0.42 lb at full load and as low as 0.39 at partial loads. Weight per horse-power is 24.2 lb without bedplate, and 29.5 with bedplate. The crank-case is of cellular type cast steel, rigid construction, arranged for separate cylinder liners. It supports the crankshaft and provides ample water cooling passages around the cylinder liners. There are stud bolts to hold the heads on liners to the crank-case and the main bearing to the crank-case. The crankshaft has seven babbitted steel-backed main bearings, chrome-nickel steel forging, machined all over, and drilled for pressure lubrication from main bearings to crank pins. It is dynamically balanced with counterweights forged integrally. The individual cylinder liners are of centrifugal cast nickel iron, the piston bore is highly finished, and the outside is coated with a rust-resisting material. The bedplate is of welded steel, and of rigid construction with minimum weight. It supports both engine and generator, and contains the lubrication oil sump and reservoir. Cylinder heads are cast aluminium with cored water passages, renewable steel valve seats, dual inlet and exhaust valves, rocker arm mechanism, and single atomizer located at centre of head. They are easily removed, and there is ample provision for the cleaning and inspection of water passages. Valves are dual intake and exhaust, readily accessible with renewable seats, and pressure-lubricated; they are enclosed by a hand-removable cover. The rocker arms are steel forgings mounted on brackets in the cylinder heads, arranged for pressure-lubrication. There is shim-washer adjustment for valve clearance. The ball ends and sockets are of high-grade steel, heat-treated. The camshaft is made from special heat-treated steel. The cams are forged integrally with the shaft, which is made in two parts and bolted together, the cams being ground to a master cam. The shaft is located in a cored-out chamber in the upper part of the crank-case. This permits short push-rods to the valve mechanism in the cylinder heads. The gears are mounted in a separate case at the front end, with drive to water pumps, fuel pump, camshaft, and gear pumps for lubricating oil scavenging, pressure-lubrication and governing. The pistons are of light-weight aluminium, with pressure and scraper rings. ALUMINIUM ALLOY has been extensively used in the construction of the “Comet”. The train contains one Diesel engine at either end. These drive the main and auxiliary generators. The total length of the train is 207 ft. It is 9 ft 10¼-in wide and 10 ft 11-in in height. The undersides of the three coaches are only 10-in above the rails. Spaces between the cars have been covered with rubber sheeting to reduce wind resistance. You can read more on “North American Railroads”, “The Santa Fe Chief” and “Speed Trains of North America” on this website.